Report on the 6th annual wine tasting presented by the Marin County Winegrowers Association, on Saturday, June 12th, 2010, at the historic Escalle Winery in Larkspur, California. The event is a benefit for the Marin Agricultural Land Trust, and focuses on Pinot Noirs from the Marin County AVA. The Marin Agricultural Land Trust (MALT) is a non-profit organization formed in 1980 by local ranchers and environmentalists, dedicated to preserving Marin farmlands for agricultural use. MALT works with landowners to acquire agricultural easements to prevent the spread of non-agricultural development on the area’s farmlands. MALT also works to support public policy that preserves agriculture in Marin. MALT conservation easements now total over 40,000 acres, on over 60 family farms and ranches, and this farmland produces some of the Bay Area’s best-known organic produce, dairy products, and wines. The annual Marin Pinot tastings, organized by Mark Pasternak of Devil’s Gulch Ranch, are excellent opportunities to try so many Pinot Noirs sourced from Marin County fruit. The wineries themselves were from a number of places, not just located in Marin, while the vineyards are in various locations, though mostly in the western and northern parts of the county. These are definitely cooler-climate vineyards, and overall, this character showed in the wines. A total of 15 wineries poured at the tasting, held on the upper level of the old Escalle Winery building. 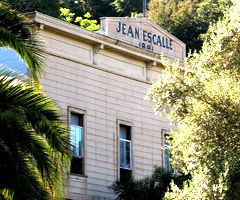 It was built by Frenchman Jean Escalle in the late 19th Century, and had 23 acres of vineyards on the adjacent hillside. Sadly, the winery did not survive Prohibition. The space featured photos of historic Larkspur on many of the beautifully-carved wood paneled walls. The only drawback was that the hot weather on the day of the event made the interior of the space uncomfortably warm – leading to many of the wines being served at a higher temperature than would have been ideal. Aside from the afternoon heat, it was a fine venue for the tasting, and there was plenty of space to mill about from table to table. The tables themselves were generously-sized, so there was very little crowding in front of them. The attendance seemed down a little bit from last year, perhaps due to several other wine events being held the same day. The main thing that could have been handled better was that the dump “buckets” at the tables were actually just large plastic drinking glasses, which meant that they disappeared frequently as they were emptied. But aside from that minor nit-pick, the event was well-organized and ran smoothly. The food, located just outside the entry door, was simple but delicious. We enjoyed two kinds of freshly-grilled rabbit sausages from Devil’s Gulch Ranch, venison from Point Reyes Vineyard Inn, plus bread from Il Fornaio and Cowgirl Creamery cheeses. Al Osterheld and I got through all of the wines being poured at the tasting, and we both felt that the overall quality was very good. I’d say that the wines poured this year were a notch above last year’s wines. A few producers poured some of the same wines as last year, though most featured new releases, along with a couple of library wines and some previews of upcoming releases. As was the case last year, tasting all of these Marin Pinots together gave me a good sense of what this growing region is about. Nearly all the wines were lighter in color and body than most California Pinots, with predominantly red fruit character and spice accents, often with some floral notes as well, and with abundant natural acidity. I’d tried wines from most of these wineries at last year’s event, but there were a few newcomers. Skywalker Vineyards is a new label with fruit sourced from filmmaker George Lucas’ Skywalker Ranch. 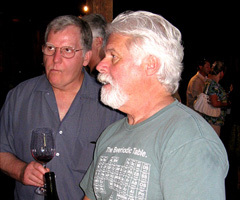 And Acacia and DeLoach – both well-known Pinot producers – were each showcasing their first Marin Pinots. Many of my favorite wines from the tasting were from the same wineries I liked last year – good to see consistent quality from these producers. A handful of other wines were just a notch below the “highlight” level. Overall, this was another very good sampling of Marin County Pinot Noirs – they have a distinctive character to them, and there are some good bets for those looking for lighter-styled California Pinots. 2008 Pinot Noir, Redding Ranch Vineyard. Medium-light color, ripe red fruits with earth and mineral notes along with some vanilla/oak undertones, medium-bodied with good acidity and structure. Comments. This is Acacia’s first Pinot sourced from Marin County fruit. Planted in 2001, Redding Ranch is at about 1,100-foot elevation on a hilltop near Nicasio. 2009 Pinot Noir, Marin County. Barrel sample. Sourced from Stubbs, Corda, Lucas, and Azaya Vineyards. Medium-light color, spicy and slightly floral red fruits, silky texture, lively mouthfeel. 2009 Pinot Noir, “Single Vineyard,” Marin County. Barrel sample, from an as-yet unnamed vineyard west of San Rafael in Central Marin. 50% new oak. Medium-light color, darker fruit profile with a more noticeable vanilla/oak component, a bit more weight on the palate but still with good acidity and a fairly bright finish. 2008 Pinot Noir, Devil’s Gulch Ranch. Aged 14 months in 33% new oak. Medium-light color, intensely aromatic, with ripe cherry, flowers, and spicy oak. In the mouth, this seemed more extracted than most wines at the tasting, but still balanced, nice. 2004 Pinot Noir, Marin County. First vintage from the vineyard. Fairly light color, with somewhat tart red fruit and a bit of earthy funk. Still retaining good structure but a little short on the finish. 2005 Pinot Noir, Marin County. Medium-light color, showing pretty floral notes along with black cherry fruit, and touches of earth and dried herbs. More weight in the mouth than the ’04 with some moderate tannins on the long finish. This wine seems to be hitting its stride and should continue to age nicely. 2006 Pinot Noir, Marin County. Medium-light color, displaying black cherry / raspberry, spice, a floral note, and a hint of tea leaf. Bright acidity and good structure for aging, just a touch tart on the finish but still quite tasty. 2007 Pinot Noir, Marin County. Medium-light color, showing more youthful, primary cherry fruit along with some spice and vanilla/oak, and a fairly smooth texture on the palate. The components all seem to be there but they still need time to settle down and fully integrate. 2008 Pinot Noir, Marin County. Barrel sample, about 75% whole-cluster fermentation. Medium-light ruby color, with a more distinct floral aroma plus black cherry / raspberry fruit and spice. Very lively on the palate, and not especially tannic given all the whole cluster fermentation. With a surprising lack of youthful stemmy character in the aromas, this could be a really interesting wine as it gets some bottle age. Comments: The Kendric wines are all from estate fruit, and aged in about 40% new oak for around 16 months. Grower / winemaker Stewart Johnson pulled out a couple of older vintages and a new barrel sample for a nice vertical tasting. 2006 Pinot Noir, Redding Ranch. Medium-light color, sour cherry, some oaky notes, and a touch of oxidation, medium-bodied with moderate acidity and some noticeable tannins on the finish. 2007 “Trois Filles” Pinot Noir, Marin County. Sourced from three vineyards, aged 14 months in 30% new oak. Medium ruby color, displaying bright aromas of ripe cherry, clove, and earth, along with a slight floral note. Silky mouthfeel with good structure and a long, lively finish. An elegant and perfectly balanced Pinot, my favorite wine of the tasting. Comments: Pey-Marin has shown consistent quality among all their wines, and has to be considered among the top producers in Marin County. NV Blanc de Noir, Marin County. The only sparkling wine of the tasting, made from 100% Pinot Noir. Very light pink-salmon color, showing somewhat yeasty cherry and strawberry aromas, lighter-bodied with a clean finish. 2007 Pinot Noir, Estate, Marin County. Medium-light color, with high-toned black cherry and very spicy oak aromas (American oak?). On the palate, the acidity seemed harsh and the finish was rather short. 2006 Pinot Noir, Chileno Valley Vineyard. About 30% whole-cluster fermentation, all native yeast, no sulfur until before bottling. Medium-light color, ripe cherry with notes of spice and earthy funk. Good acidity and a moderately tannic finish. 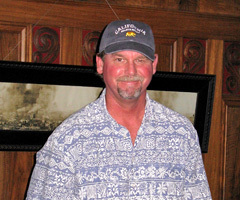 Comments: Precedent is made by Thomas Fogarty associate winemaker Nathan Kandler. 2006 “Andromeda” Pinot Noir, Devil’s Gulch Ranch. From old-vine Martini clone plus newer 115, 667, and 777, 50% new oak. Medium red-purple color, displaying bright and spicy red fruits, with hints of earth and dried herbs – maybe a touch of mint. Great acidity on the palate, where a bit of tartness creeps in, and a very long, tasty finish. 2007 “Andromeda” Pinot Noir, Devil’s Gulch Ranch. A bit darker color than the ’06, with a more tangy cherry character and distinct clove notes. Bigger-bodied than the ’06, with more tannin on the finish. Comments: These wines were both quite distinctive – at this point, I preferred the ’06 but the ’07 should develop nicely with more bottle age. 2006 Pinot Noir, Estate Grown, Marin County. Medium-light reddish-purple, some floral notes along with bright cherry, earth, and a touch of leather. Medium-bodied with very good acidity, there was some tartness and tannin on the finish. 2007 Pinot Noir, Estate Grown, Marin County. Medium-light purple color, the aromatics were more closed than on the ’06 wine, but displayed a bit riper fruit and some spice. Slightly more weight on the palate, and a rounder and smoother finish than the ’06. Comments: Mary Stubbs told us that the 11-acre Stubbs Vineyard, planted in 1996, is the only certified organic vineyard in Marin County. The wine is made by Dan Goldfield. 2008 Pinot Noir, Skywalker Ranch. From 115, 828, 667, 777, and 23 clones, 40% new oak, about 14 months in barrel. Medium color, very pretty black cherry/raspberry and spice on nose, mouthfilling texture and very good balance, with a notably long finish. Comments: The richest Pinot of the tasting, this had several people talking about it afterwards. The ’08 was from the first commercial crop from the vineyard, and it will be released this fall. 2007 Pinot Noir, Corda Family Vineyard. About 25% whole-cluster fermentation, 40% new oak. Medium-light color, strawberry / cranberry along with some stemmy and spicy aromas, some wet stone / mineral notes, and vanilla/oak undertones. Firm and structured on the palate, with a lively finish, quite nice. 2006 Pinot Noir, Marin County. Medium-light color, slightly tart and spicy black cherry, medium-bodied with lively acidity, and a more tannic finish than most wines at the tasting. 2007 Pinot Noir, Marin County. Medium-light color, with black cherry fruit, clove/spice, and a touch of funk that mostly blew off but gave the wine some interesting complexity. Nicely structured in the mouth with milder tannins than the ’06. A distinctive and nuanced wine. 2008 Pinot Noir, Marin County. Medium-light red-purple color and slightly cloudy, pretty floral notes and cherry / raspberry fruit, along with a nicely-integrated touch of oak. Medium-bodied on the palate, this could use a bit more time to settle down but shows some good potential. Comments: I was impressed once again by David Vergari’s Pinots. 2007 Pinot Noir, Chileno Valley Vineyard. Medium-light color, bright cherry / raspberry with some earthy overtones. Fairly light-bodied, with a lively mouthfeel and medium finish. 1998 Pinot Noir, Chileno Valley Vineyard. Slightly lighter red-purple, showing a little brick color around the edges. Displaying very spicy red fruits, this still seems fairly youthful, with plenty of acidity and brightness on the palate. Aging very nicely, and should have a number of good years ahead. Comments: I liked the ’07 better this year than I did last year – perhaps it just needed some bottle age. The ’98 was a great treat to taste. 2007 Pinot Noir, Marin County. A little Sonoma Mountain fruit blended in. Medium color, bright cherry / raspberry with a touch of vanilla/oak, lighter-bodied with lively acidity, the finish was a bit tart and short. 2008 Pinot Noir, Chileno Valley Vineyard. About 70% new oak, with around half of that being Polish oak. A little lighter in color, this had brighter fruit aromas of cranberry and strawberry, along with a pretty floral component and spicy oak undertones. A bit more weight in the mouth than the Marin County bottling, plus some tongue-tingling acidity and a little tannic bite on the finish.